MEDICARE’s Annual Enrollment Period begins on October 15, 2018 and ends December 7, 2018. It is during this time that all individuals Aged 65+ should evaluate and review their health care needs for the upcoming new year. If already enrolled, you will receive a letter from your current carrier that will include an Annual Notice of Change (ANOC), which will give you a side by side comparison of what the plan you are on in 2018 will do in 2019. You will want to consider cost, doctor networks, co-pays, deductibles, Maximum out of Pocket amounts and your Prescription Drug tiers. If you simply pay the January 2019 updated premium, you will automatically be renewed with the plan updates. Our office is available to discuss plan changes, updates and options available to you in 2019. If you are happy with your plan and do not anticipate any changes, simply pay your updated premium for January 2019. If your needs have changed and you wish to re-look at your options, please contact us as soon as possible so we can help you evaluate for 2019. Please be prepared with your list of providers and any RX’s you are taking (include the exact spelling of the RX, the dosage level and frequency taken). Our Benefits team is certified in 2019 with Regence, Providence, Health Net, United Healthcare/AARP, Pacific Source, MODA and ATRIO Health Plans and are happy to review your options with you. Any changes you wish to make will need to be done by December 7, to be effective January 1, 2019. OPEN ENROLLMENT into the Individual/Family Plans for 2019 will start November 1, 2018. 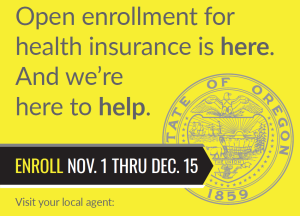 Open Enrollment will end on DECEMBER 15, 2018. If currently enrolled, your carrier will be sending you a letter on what your plan is doing for 2019. If you would like additional information on your plan choices for 2019, please contact us and we can discuss your options. If interested in a quote, please be prepared to provide your address, income information, and any details specific to your situation. IF YOU DO NOTHING – Your carrier will renew your plan automatically and will initiate payment if you have not stopped it. The plan you have for 2019 will be the plan that they have MAPPED you to and you will be charged that premium for January 2019. IF YOU WANT TO CHANGE PLANS or CARRIERS – Please contact us as soon as possible to review your options. IF YOU ARE ON THE EXCHANGE WITH TAX CREDITS and/or COST SHARING – You MUST update your “Estimated Adjusted Gross Income” (AGI) for 2019 and review and secure your plan option. Please contact us for assistance. IF YOU WANT TO CANCEL your plan because you no longer need coverage, you MUST contact the carrier to terminate.